Game Situation: High Blood Sugars, Insulin Resistance +/- Obesity. Goal: Reverse Type 2 Diabetes. Action: Address the “root cause” of type 2 diabetes – Fat cell Overcrowding/Insulin Resistance. Purpose: Improve Health and Reduce risk of other Chronic Diseases. 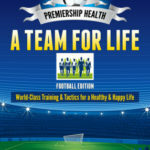 The purpose of this playbook is to put the individual back in control of their health, to manage it better in each of the 3 key areas: Mental, Physical & Tactical. This information is not intended to replace any medical advice. It is merely outlining the actions I myself would take as a Premiership Health Manager, faced with a diagnosis of type 2 diabetes.